As Intel Extreme Masters Season 12 is ready to kick off in Sydney, Australia, HyperX, the high performance division of Kingston Technology, will once again be the exclusive peripheral and memory partner for the brand new season. 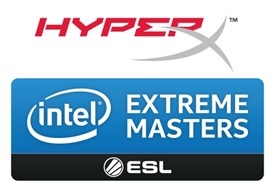 This will be the fifth consecutive year HyperX team up with Intel Extreme Masters and elite players around the world will be practicing and competing with HyperX headsets, keyboards, mice and systems complimented by HyperX memory in IEM tournaments. As eSports community continues to grow, HyperX are at the forefront of delivering unparalleled performance and award-winning products for gamers to take their game to the next level. With the highest quality gaming headsets, keyboards and mice, HyperX proudly continues its support for the Intel Extreme Masters and equipping competitors and attendees alike. Intel Extreme Masters Sydney Group Stage would begin from May 3. SK Gaming, Renegades and Vici Gaming, whom sponsored by HyperX, would all participate and bring the best competitions to fans worldwide.